...... Recovery supports all types of file systems used in Microsoft Windows operating systems, including old and modern versions of FAT and NTFS. 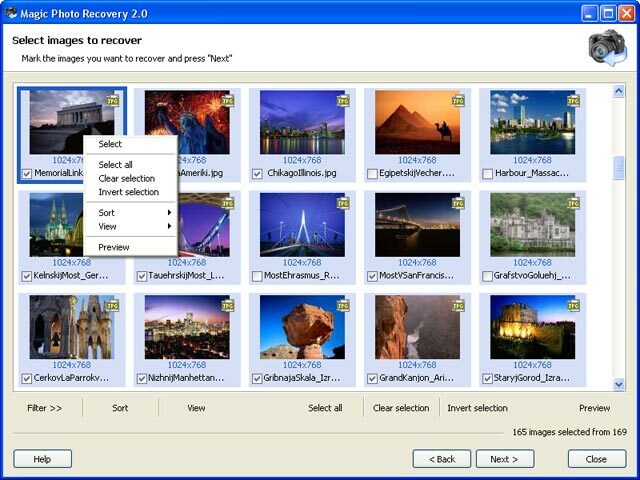 The image recovery tool supports all types of storage media, including hard disks, digital cameras, USB disks, flash sticks, a variety of memory cards such as Compact Flash, Micro Drive, SONY Memory Stick, MultiMedia Card (MMC), PC Card, Secure Digital (SD), SmartMedia, and xD-Picture Card, mobile phones, and so on). Microsoft Windows 95 / 98 / Me / NT / 2000 / XP / 2003 / Vista and 2008 Server are supported. Magic Photo Recovery can recover graphics and images in all common formats such as JPEG, TIFF, GIF, PNG, BMP and many others, as well as a variety of RAW files from various digital SLR cameras. Recover deleted, formatted and lost digital images/photos from a digital camera. Recover your lost photos, files, and data from all media types. Digital Photo Recovery software that reclaims those pics you thought you lost. Qweas is providing links to Magic Photo Recovery 2.0.9 as a courtesy, and makes no representations regarding Magic Photo Recovery or any other applications or any information related thereto. Any questions, complaints or claims regarding this application Magic Photo Recovery 2.0.9 must be directed to the appropriate software vendor. You may click the publisher link of Magic Photo Recovery on the top of this page to get more details about the vendor.